Sydney Shop Girl: Crocs At Work. Chicketti. Holiday Reads. I never thought I'd live to see the day where I'd be wearing Crocs to work but it happened today. They may not look like the Crocs you know and (secretly) love but I assure you, they are. Here, take a look at the insole. For the sake of completeness, the rest of today's ensemble borrowed heavily from my Red Phoenix Emporium archive. With a bit of Supre in the shape of these trusty black leggings. It was a bit cold in Sydney this morning. 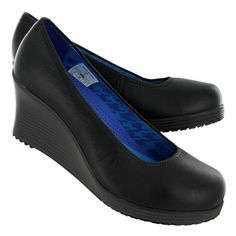 I found these A-Leigh wedges on a Mumgo sale a few months ago for $49.99 (RRP $89.99) and thought why not. They have leather uppers and lots of cushioning in the arches which you don't often get in a $50 pair of shoes. I'm glad I bought these because they really are as comfortable as their much maligned big brothers, the Caymans, only more socially acceptable on adult women in a professional workplace. In my search for comfort heels, I stumbled upon this unique interpretation from Birkenstock. The Berkleys are from a limited edition range that is made in Italy. These are on sale for $99 down from $600 but I'm not completely sold on them. To me, they seem to personify everything that Birkenstocks aim not to be. In short, they look incredibly uncomfortable but I'm open to persuasion. Have you tried Birki stillettos? In Christmas news, the Ikea starry lights have all officially been put up in the office. We had the official switching on of all windows this morning. I took this photo earlier on in the week when we'd only untangled the first set of lights that needed to go up. Aldi's looking like being my official baker for Christmas 2014. I've decided that this will be the year of Stollen over fruit cake and that's it now officially okay to start snacking on Christmas baked goods. These bites are delicious and only $3.49 a packet from Aldi. I got in touch with my Perth roots with last night's dinner prep. I made my own interpretation of Red Rooster's famous chicketti (spaghetti in a meatless tomato sauce served with a side of barbecue chicken). I'm sure Red Rooster meant for the chicken to be the star of the dish but for me, it was always about the spaghetti and the way it came vacuum sealed in a plastic dish my mum would wash and repurpose in the kitchen. I made my own pasta sauce from scratch using a very simple recipe where you brown one chopped onion with garlic then add some tomato paste, stir for a few minutes before adding a bottle of passata and a generous squeeze (half a tube) of Gourmet Garden basil. Season and add a teaspoon of sugar before simmering for 15 minutes. Here is the actual recipe. I like how this sauce isn't just all acidic tomato tasting. It's got a bit of sweetness and some oomph from the herbs. Huge taste pay off for minimal effort and prep. I might use it as the base for a lasagna next time. Also, using a pizza sauce sachet rather than plain tomato paste was an ingenious move, if I do say so myself. Chopped up Chicketti spaghetti for Toddler SSG. Not pictured is the equally picturesque shredded rotisserie chicken that gives Chicektti its name. Then pour over your cooked spaghetti and top with parmesan. It was a bit sacrilegious using fresh paremesan, though. The gold standard condiment is in fact this dessicated Kraft version that has the consistency of soft sand and smells stronger than it tastes. I can see a day in the not too distant future where Chicketti will be embraced by the Sydney food scene, usurping dude food, macarons, udon and Korean fried chicken. And you'll be one step ahead thanks to this post. I know the silly season is mostly about food, drink and gifts but if you're planning some time relaxing with a book, I've been reading a couple that would be perfect holiday fare. The first is Latinalicious from one of my favourite travel writers, Becky Wicks. Becky manages to be everything I need from a travel writer. She's hilarious when it comes to detailing her misadventures abroad while being very sensitive and respectful of the countries she's visiting (Bali, Dubai and many though South America). Her memoirs are a fast paced mix of the people she's met, accounts of the beautiful scenery around her as well as references to the current affairs of the region she's visiting. Latinalicious takes arm chair travellers like myself to places in South America I'd never be brave enough to visit myself. Okay, I'll just go out and say it. I know I'm too high maintenance to lodge in guest houses as I follow the Inca Trail and far too afraid to cycle down Bolivia's Death Row. But as I lounge on the sofa under the air conditioner with a drink with arms reach, I'm more than happy to live vicariously through Becky as she Carnivales in Rio and goes on a spiritual odyssey as she drinks ayahuasca. 'It Started With Paris' is Cathy Kelly's latest best seller. It follows the lives of a couple who get engaged atop the Eiffel Tower before returning to Ireland to prepare for the wedding and the arrival of their baby. Their extended family and friends get caught up in the excitement of both big events as relationships (and people) change along the way. I admit that I found it very slow going in the first half as I struggled to connect each new character I was introduced to with either Katy or Michael. The characters seemed to move through real life issues like unresolved feelings about exes, aging parents and teenager dramas at a glacial pace but as I reach the final chapters, things are picking up pace. There's a host of new beginnings on the horizon as well as familial relationships being rebuilt. And all against the backdrop of soothing suburban Ireland in words that easily wash over you like the sea breeze at the end of a long, hot summer's day. Have you got any interesting books on your holiday reading list? I'm heading to Ikea today actually. Should get a gignerbread house whilst I'm there. Good to know, Den! Will look out for the sling backs. Unfollowing your blog because of Crocs. Kidding.. the flats (not the slip on ones you know which one) look cute. I have been looking for a colourful pair.